Runners should read the Conditions of Entry and Rules for Runners for more details. Runners wishing to register early, to take advantage of the £15 discounted entry fee, should download the registration form, print and complete it, and then send it (with a cheque for the entry fee made out to OTMOOR CHALLENGE ASSOCIATION) by post to Jill Meyjes at the address detailed on the form. If you do not have a chequebook, please contact Jill Meyjes to make alternative payment arrangements. For those runners wishing to enter on the day, the Registration Desks will be open from midday until 1.45pm. Registration forms will be available to complete before you check-in at the appropriate desk. 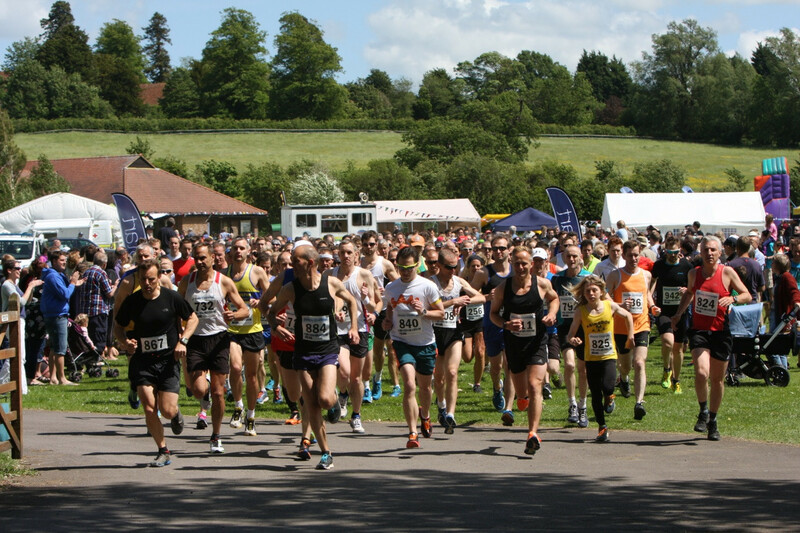 You will need to pay the entry fee of £18 (by cash or cheque only), and will then be issued with your bib race number, which must be pinned to your chest. We encourage all runners to form teams of four, which can comprise all male, all female or mixed runners from any of the age categories. Times and finishing positions are recorded using the traditional Otmoor Challenge "manual" method, and a copy of the finishers list with times is placed on the PA cabin as each sheet is completed. A full list is provided on this website within 2-3 days of the race. Facilities on the field include changing rooms, showers, toilets and, of course, a range of refreshments at the fete including the licensed "Challenge Bar", sandwiches, cakes and teas, as well as a BBQ. There is plenty of free parking available on the field, and car keys may be left with the commentator in the PA cabin during the race. The prizegiving takes place on the field at about 4.30pm, or as soon as the results have been checked and the winning teams identified. Please note that team prizes are awarded in male/mixed and female categories to the teams that are the first to have all their members home, not to the teams with the lowest aggregate place scores. The Noral Cup to the fastest man and awards for the first 3 home. A Silver Plate to the fastest woman and awards for the first 3 home. The Otmoor Cup to the fastest man veteran (40+) and awards for the first 3 home. The Nexel Cup to the fastest woman veteran (40+) and awards for the first 3 home. The Wenden Cup to the fastest man super-veteran (50+) and awards for the first 3 home. The Lyster Cup to the fastest man super-veteran (60+) and awards for the first 3 home. The Ogden Trophy to the runner in 100th place. Challenge Cup and Awards to all 4 members of the first MEN'S or MIXED TEAM to have all its members home. Challenge Trophy and Awards to all 4 members of the first WOMEN'S TEAM to have all its members home. 1. All runners must register at Registration between 12 noon and 1.45pm on Race Day. 3. All runners must be 16 years or over and must agree to accept the event rules. At the discretion of the Race Director, a younger person may enter when accompanied by a responsible adult. 4. By entering the race, all runners certify that they have no medical conditions that would prevent their undertaking the Otmoor Challenge, and that they are fit to compete in the race. 5. Pre-entries pay a reduced entry fee of £15.00. The entry fee on the day of £18.00 is payable by cash or cheque before the race starts. 6. The Otmoor Challenge Association encourages runners to gain sponsorship for their favourite charities. However, the Association does not organise sponsorship nor accepts sponsorship in lieu of the appropriate entry fee. Runners should collect their own sponsorship funds and pass them direct to the charity concerned. 7. Bib race numbers must be collected from the Registration Desks on the day. Runners not wearing an allocated race number will not be permitted to start the race. Numbers must be worn on the chest only. 8. Runners may not pass on their race entry or race bib number to any other person. 9. Categories of runners are determined by age on the day and date of the race. Prizes will be awarded to the first three runners in each category. 10. Individual runners can form teams of four but will retain their individual race numbers. Teams can comprise male and female runners of any age or category. All four members of the team must report together to the Team Registration Desk to register as a team after they have registered, paid their entry fees and received their individual bib race numbers. Runners in teams will still be eligible for individual prizes. 11. A Challenge Cup or Trophy will be awarded to the winning team, together with an award for each member of the winning team. The winning team will be the first team with all four members crossing the finish line, regardless of individual positions within the race itself. Teams comprising both male and female runners will only be eligible for prizes and awards within the male team category (the Challenge Cup). 12. Team awards will only be made in both male and female events when there are at least two teams competing in each category. 13. Runners wishing to take dogs with them must keep them on short leads at all times, and must start from the back of the Mass Start. 14. All runners must follow the instructions of the Race and Course Directors and the Race Marshals at all times. Any runner disregarding such instructions or acting in a way that is hazardous to themselves or others may be disqualified immediately by the Race or Course Directors or the Race Marshals. 15. The first 350 finishers will receive an award. 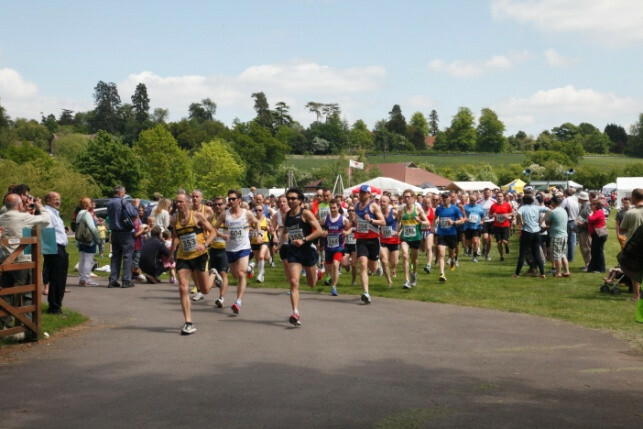 To qualify as a finisher, runners must complete the whole of the signed course. Any runner not following the signed course will be disqualified. 16. Any disputes or appeals must be discussed with the Race Director at the time and no later than the prizegiving on race day. The decision of the Race Director in all matters connected with the race is final.